In the latest Q4 2018 report to its shareholders, Netflix revealed to get an estimated 10% of television screen time in the United States (the company serves around 100 million hours per day to television screens and estimates 1 billion hours per day of television screen time, considering 120 million homes, an average of four hours and two televisions per household, in addition to hotels and bars), while it is less than that on mobile devices. Interestingly, Netflix pointed out that screen time is earned from a very broad set of competitors. The company believes to compete with (and lose to) Fortnite more than HBO, for instance. There are thousands of competitors in the fragmented market of entertainment, each one vying for the attention of consumers, and that’s why Netflix believes growth can only come through the improvement of the viewing experience, which is where the focus is instead of specifically gunning for other streaming services like Amazon Prime or the upcoming Disney+. Essentially, the more high-quality original shows and movies become available on the platform and the higher the screen time will be, even pulling people away from games; after all, there are only twenty-four hours in a day (sadly). 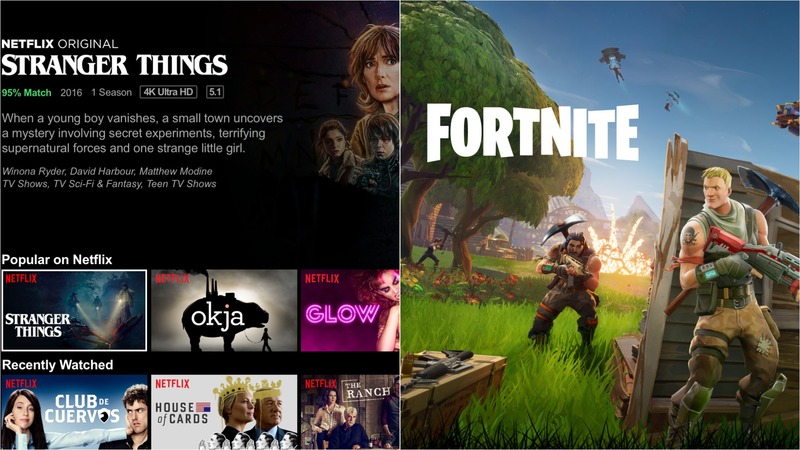 Of course, the fact that Netflix went as far as naming Fortnite as its biggest current competitor for screen time provides an outlook of the incredible social phenomenon that is Epic’s game. The company’s vision of enabling true cross-platform multiplayer for the first time across PC, console and mobile certainly helped a great deal, since gamers can now keep playing with their friends regardless of the respective platforms used. The report is very positive about the recent Black Mirror: Bandersnatch interactive movie. In fact, there are plans to use the storytelling system called ‘Branch Manager’ to build additional interactive movie projects, bridging the gap between movies and games. Lastly, The Witcher fans may be disappointed to see that the upcoming TV show starring Henry Cavill as Geralt of Rivia wasn’t mentioned in this report. That doesn’t necessarily mean the series won’t premiere in 2019, though, as only a few of the shows planned for this year were mentioned in this case. In related Netflix news, the recent pricing increase in the United States led shares to rise.